Contact us to donate by check, stock, or in other currencies. 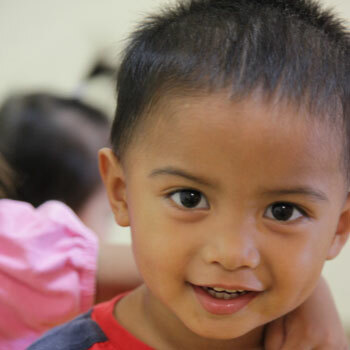 The Rehoboth Children’s Home located in Sampaloc, Philippines provides a safe haven for children who have been orphaned, abandoned, abused or neglected. The Rehoboth Home has a capacity for 48 children and its operational budget is supported by generous donors such as you. A child stays in care at Rehoboth until a plan can be made for their future which may include reunification with their birth family, local or international adoption. Thank you for helping us care for the precious children at Rehoboth! Visit the Rehoboth Children's Home page to donate. The Sacred Portion Children’s Outreach manages a child sponsorship program for the Rehoboth Children’s Home, an orphanage in the Philippines. While other types of contributions and gifts can be sporadic or seasonal, a sponsorship program provides a predictable and consistent income for the Children’s Home by which to meet the daily needs of the children for food, clothing and medical care. In addition to providing a stable support base, the sponsorship program is an opportunity for others to become involved and have a role in providing love and care that can transform the life of a child. Sign up to sponsor a child at $35 per month. You can indicate an automated monthly or annual payment. We will send you a profile and photo of your sponsored child. You will be able to follow your sponsored child’s progress with two formal reports per year. You will also receive a personal holiday greeting from your sponsored child as well as photos of his or her birthday celebration. We love for you to feel a part of life at the Rehoboth Children’s Home by sharing periodic bits of information and pictures of special events that take place. You will also receive a monthly e-newsletter with updates on Rehoboth Sampaloc Ministries in the Philippines. Visit our child sponsorship page for details. Many older orphans have been adopted by participating in our hosting programs, changing the trajectory of their futures. You can help give a child HOPE by contributing to Summer of Hope and making it possible for more children to have the opportunity to find their “forever” families. The Sacred Portion Children’s Outreach is dependent upon donations and grants in order to carry out its mission of creating better environments and brighter futures for children without families. We also rely on one or more annual fund raising events to meet our budgetary goals. You can help this ministry by attending and participating in such events.